This article gives an overview of the Big Thunder Mountain Railroad track layout for the ride in Frontierland at the Magic Kingdom in Walt Disney World Resort, Bay Lake, Florida. We cover the details on how the track is situated for the ride and give a blueprint or an outline of the track configuration. Big Thunder Mountain Railroad is located on approximately 2.5 acres and has its track fitted into the space though a series of tight turns. The track has 3 inclines and 3 portions where the ride takes you back down to ground level or close to it. The ride is the fastest attraction in the Magic Kingdom (36 mph), which makes the downward portions “fast”. 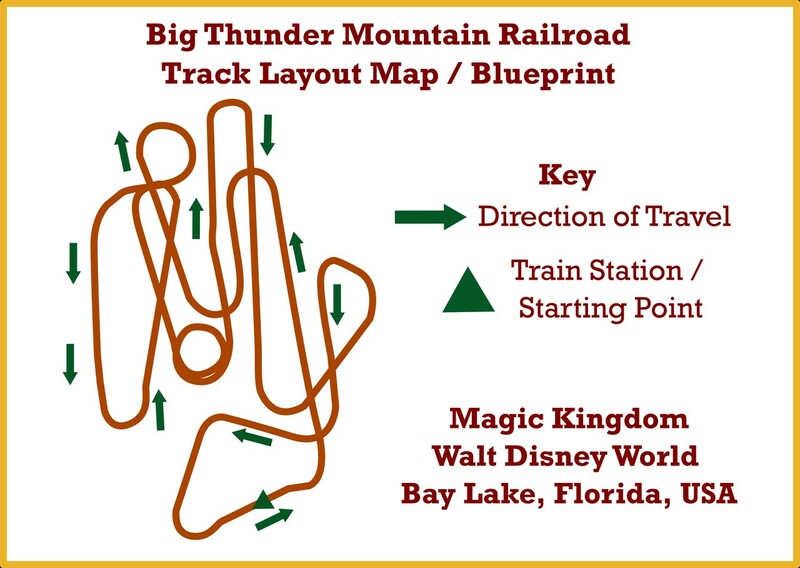 To help guests see the track layout, we have created a track layout map for Big Thunder Mountain Railroad. This can also be considered a basic Big Thunder Mountain Railroad blueprint of the attraction. It is featured below. Above Big Thunder Mountain Railroad Track Layout Map or Blueprint created by NavFile. The track layout for Big Thunder Mountain Railroad is described below. All of the turns, inclines, and downward portions are covered. 1. Straight out of the station / boarding area. 2. Left into the mine. 3. Straight / Incline (Up). Bat Cave Portion. 21. Incline / Up (In Cave). If you would like to learn more about Big Thunder Mountain Railroad please visit the other pages on our site about the attraction.